Monday 12th to Wednesday 14th March 2018. 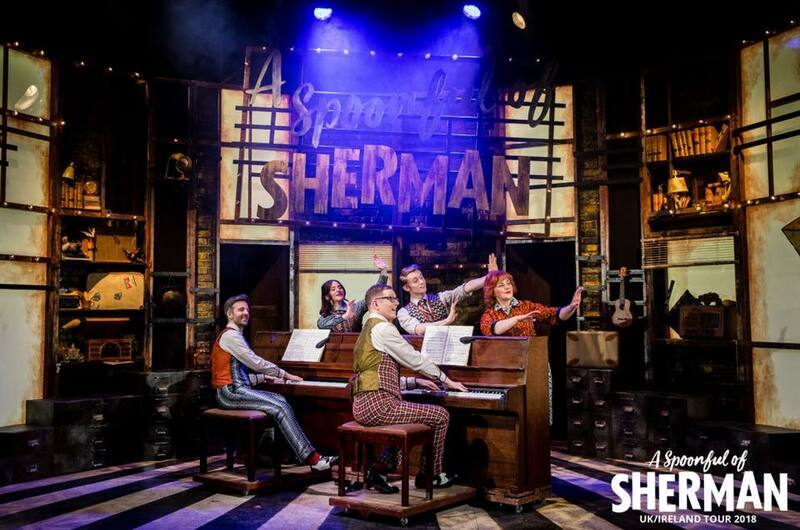 Spoonful of Sherman appears in Darlington on a short run which celebrates the family that wrote many of the classic Disney songs from Winnie The Pooh to Mary Poppins and The Aristocats plus much more. Al Sherman was born in the Ukraine in 1897. He had to give up his formal education and became a self-taught pianist and songwriter. After arriving in 1909 he found work creating the mood music for the silent movies. After making his name creating catchy tunes for Tin Pan Alley in the 1920s- 1940s he created hits for Ella Fitzgerald, Billie Holiday and Frank Sinatra. But crucially for this show he had 2 sons that would follow him around America. 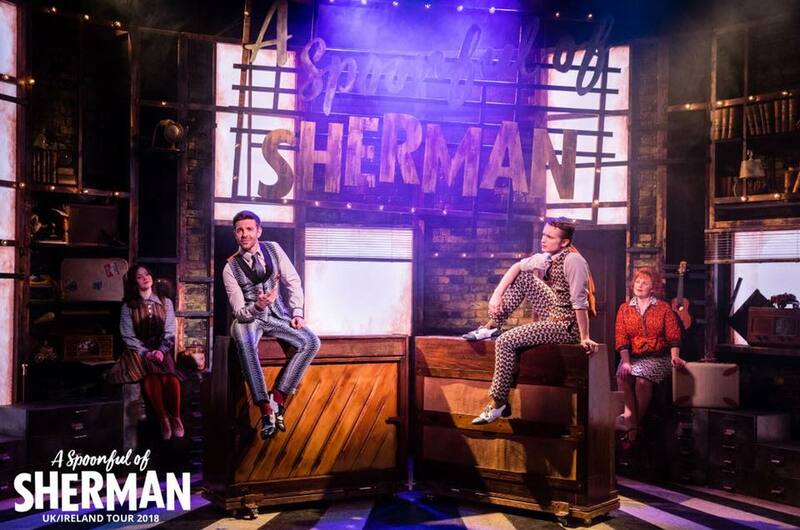 Robert B and Richard Sherman would eventually form a song writing partnership which would deliver hits like You're Sixteen and provide the musical numbers that would accompany Walt Disney's treasured output. 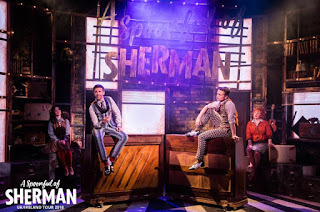 The first act builds up the Sherman legend from Dad Al's work through to Winnie The Pooh and Mary Poppins. The cast of 5 sing, dance and play 2 pianos that seem to get pushed around the stage a lot. Lots of harmonies blend their voices together well on many numbers whilst each performer gets their opportunity in the spotlight. The songs start with the less familiar work by Dad Al which is catchy enough and it is easy to see why he was in demand. Of course the real crowd pleasers are the Disney classics which, as the cast keep reminding us, are the soundtrack to our childhood. In fact the children in the audience were really getting into it, especially one girl in the front row whose enthusiasm was infectious for the rows behind. 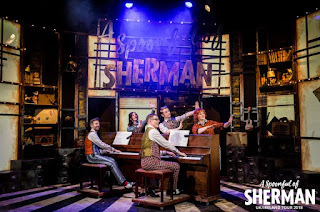 The show includes some songs by the most recent musical member of the family, Robert J Sherman, who is also responsible for the writing the book of the show. 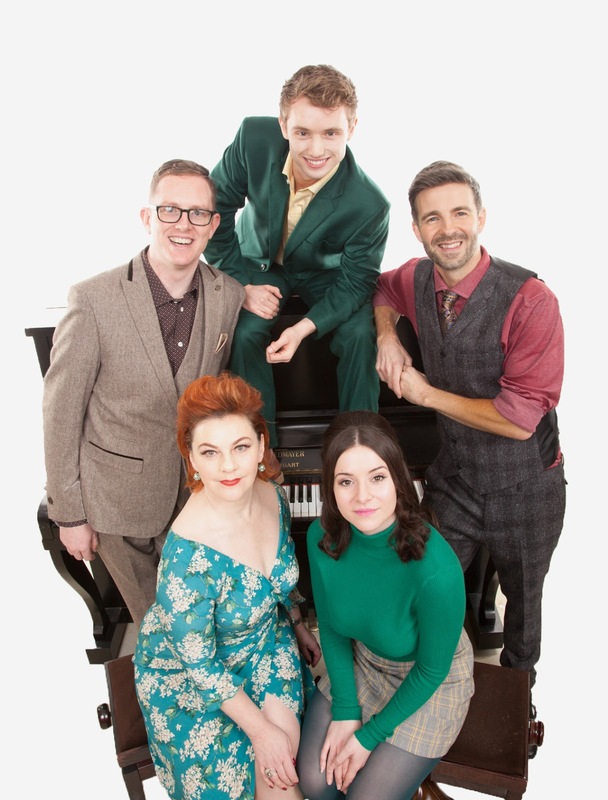 The family have been entertaining audiences for over 100 years. Having a tribute compilation show is nothing new. I've had my doubts about those shows which don't know if they are telling a story about the performers or just singing / dancing to the songs (Thriller or Jersey Boys). Making matters worse are those shows with an irrelevant non-existent book to feed each tribute song (Son of a Preacher Man). 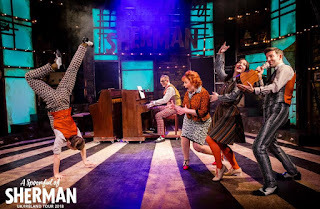 At least with Spoonful of Sherman it knows what it is aiming to do and, unlike Jersey Boys, it sticks to it for the whole show rather than going into full tribute concert mode in act two. What we get are the songs, weaving with the family story, in chronological order. Naturally the story, with a book by a later generation of the Sherman family, Robert J Sherman, is unashamedly biased about the songs. But with a back catalogue as rich as this one you cannot blame them for blowing their own trumpet in their own show. The songs are, indeed, singable, sellable and sincere. Director and choreographer Stewart Nicholls has kept the pace going. The cast work hard and engage with the audience and each other even when not directly bring involved in the numbers. Sophie-Louise Dann and Jenna Innes make easy work of the higher notes whilst Glen Facey looked after the lower pitches. The dance routines are contemporaneous to the songs and there's plenty to enjoy. 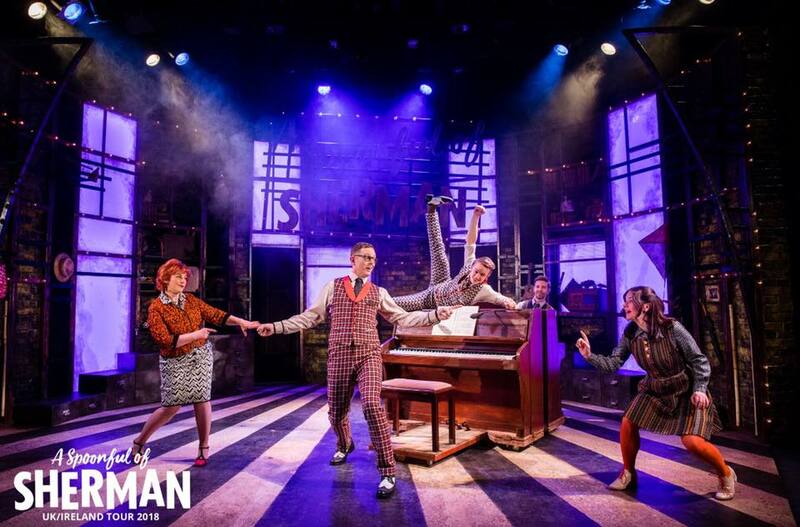 The two pianists, Ben Stock and Mark Read, have their work cut out multitasking on the piano whilst taking their part in their bigger roles at the front. The set of bricks and shelves with a large sign with the show title on helps keep the focus on the performance. I enjoyed the show. Without the pretentions of being something it wasn’t, the show was successful. The hardworking cast ensured that we were informed, we were entertained and we had a chance to relive happy memories. Of course as act 2 finished mainly on Chitty Chitty Bang Bang it acts as a perfect trailer to the Darlington Operatic Society's show of that very musical which will be the first amateur production of it in the North East. 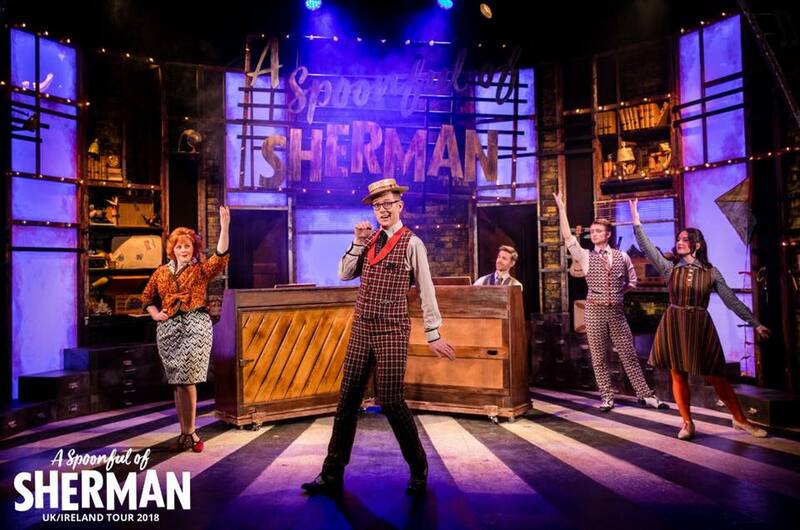 A Spoonful of Sherman is at Darlington Hippodrome from Monday 12 to Wednesday 14 March.